Manila Doctors Hospital’s (MDH) recently signed a Memorandum of Understanding (MOU) with Metropolitan Manila Development Authority (MMDA), Through the partnership, MMDA personnel belonging to Salary Grades 1-12 which include traffic aides, street sweepers, and flood control personnel can now access subsidized services in the MDH-CSR Clinic for seven (7) medical departments that include Family and Community Medicine, Internal Medicine, Obstetrics and Gynecology, Ophthalmology, Othorhinolaryngology (ENT or ORL-HNS), and Pediatrics and Surgery. MMDA personnel are also given discounts on 143 laboratory and diagnostic procedures and hospitalization. 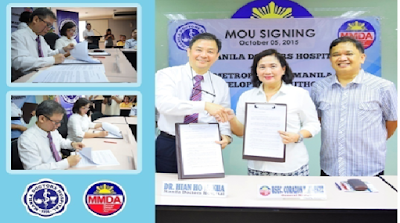 Families of MMDA personnel can also benefit from the services.